We're all familiar with the spooky story of Mark Foley, a ramrod-straight Republican who, in late 2006, was revealed as a man possessed by peculiar demons which ultimately caused him to disappear from Congress. Along with Foley, the site formerly residing at the domain markfoley.com was removed at around the same time and replaced by a generic parked page provided by hosting company GoDaddy. What's truly odd about this parked page is the way it displays contextual advertising from other candidates and political causes. For example, there's a prominent placement from barackobama.com, as well as one for Rudy Guiliani. Are either of these two candidates aware that they are paying for placements on the abandoned site of a disgraced former congressman? Prolly not. 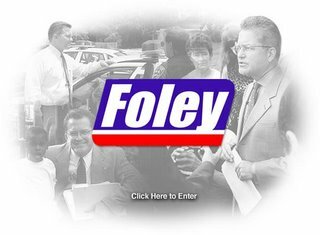 The Internet Archive, by the way, has some very well-preserved instances of MarkFoley.com. Several conservative national groups have praised Mark for fighting to protect children, seniors and veterans, controlling federal spending, protecting Second Amendment rights, promoting fiscal responsibility and providing real tax relief to hard-working Americans. Always take a friend when playing or going to malls, movies, video arcades or parks. Don't accept special treats or gifts from a stranger. Don't get into a car or go near a stranger's car. Don't be afraid to say no and get away from strangers who create uncomfortable or confusing situations. Yup - that's very sensible advice.